RT 1.02 and RTB 1.02 models of measuring chambers – differs in size sample holder, RT allows measurements of samples having the shape of cylinder or cuboid with the base dimensions or diameter ranging from 8 to 30mm, RTB holder is designed for cylinders or cuboids with a base dimensions of the 50÷150 mm. 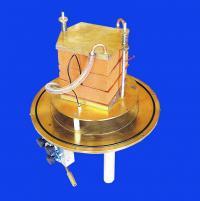 The measuring chambers are built by universal way to fit the model conditions of the transient methods. 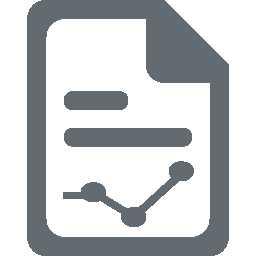 In our laboratory we perform measurements using pulse transient method, step-wise transient method and newly developed planar transient hot disk method. 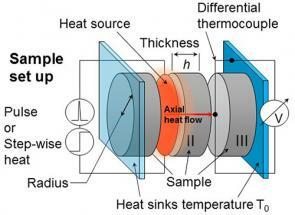 Transitient methods allow to determine all the three basic thermophysical parameters within a single measurement (coefficients of the thermal diffusivity, the thermal conductivity and the specific heat capacity). RTLab1.02 multifunctional electronic unit for the experiment control, data acquisition and data storage designed for the transition methods based on principles of the heat flow generation in the pulse or in the sep-wise form. 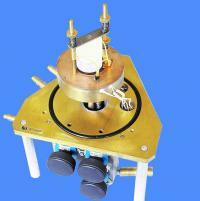 RTA-V multifunction unit for experiment control, data acquisition and data storage for transition methods based on the generation of heat flow by the planar hot disk in the form of step-wise. 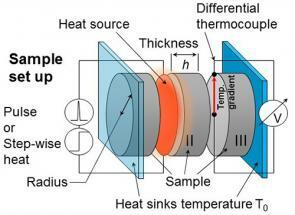 For the laboratory measurements in the measuring chamber RT and RTB we use thermostats LAUDA RK20 and LAUDA Proline RP 845 C.
The hot ball method has been developed to monitor temperature-moisture changes in the field conditions. 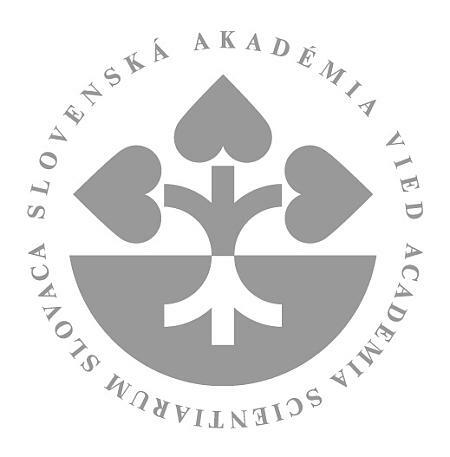 By using this method the moisture-temperature regimes are monitored at the followiing cultural herritage sightseengs: in the Dome of St. Martin in Bratislava, the St. James´ Church in Levoča, Spiš castle and in the volcanic tuff cliff situated in the Tekov museum of Rocky Dwellings in Brhlovce. View of the tuff cliff wall in the Tekov's museum of Rocky dwellings in Brhlovce and monitoring system with a solar recharging RTM-Solar. 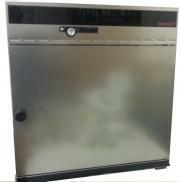 Memmert – Vacuum drying oven VO200 with two thermoshelves allows vacuum drying up to 200 °C. 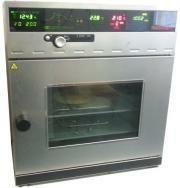 Vacuum oven VO "Celsius" standard softwar, model size 200 /+20 °C to +200 °C /10 mbar to 1100 mbar. Memmert – climate chamber for conditioning the moisture content in the porous material humidity chamber HCP (Temperature range up to +90 °C (without humidity up to +160 °C)) Humidity 10 to 90 % rh. Muffle furnace LAC L 15/12 Ht40P for temperatures up to 1200 °C. High temperature furnace LIINDBERG Blue model 5444 to 1500 °C (left). Inside it is placed the ceramic alumina tube with a flanges and the possibility of vacuum pumping through Balzers molecular pump. In the tube it is placed sample ceramic holder for the measurements by the pulse transient method (right). Measuring laboratory equipment: Keithley 2010 Multimeter, Keithley 2400 Sourcemeter, KEPCO Programmable Power Supply ABC 15-7 (15V/7A), Agilent Power Supply E3647A 0-35V, 0.8A/0-60V,0.5A, temperature controllers EUROTHERM. Hendheld measurement equipment: Multimeter FLUKE 289, TROTEC T600 for measuring humidity, KERN (accuracy to 0,001g). 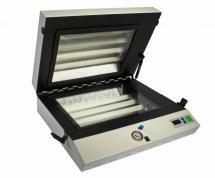 UV Double Sided Exposure Units With Vacuum AZ220 for the production of double-sided PCBs using the photomask. 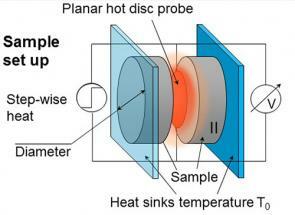 It is used for the production of the planar heat sources and sensors by photolithographic process.